It has to be said that most people don’t look forward to visiting the dentist whether it be a Dundee dental practice or any other for that matter. Fear of the dentist is right up there with heights, spiders etc. A recent study found that almost 50% of people are scared of the dentist (often referred to dental phobia). At Vita Dental Spa, we recognise this and have worked hard over the last few years to put in place an environment that is as relaxing as possible. All our staff have been trained to understand that not everyone likes to visit us. Our practice is situated in Monifieth which is close to Dundee, that’s why we like to refer to ourselves as “Your Dundee Dental Practice” because many of our patients travel from Dundee regularly to see us. Here at Vita Dental Spa we have tried hard to create an ambiance that immediately puts you at ease. As soon as you walk through the door you’ll immediately see just how friendly our staff are. We go to great lengths to ensure that your visit to us is not only pain free but maybe even a pleasure. When you visit this Dundee Dental Practice you’ll notice that not only do we offer gentle, caring dental treatment but also a range of services we think you’ll find quite pleasurable. For instance what could be more relaxing than a soothing massage? We offer a range of different massages, see the Complimentary Therapy section on our website, this is something you really will want to try. As well as our complimentary therapy, we offer a range of Facial Aesthetic treatment. These include our Acne Clinic, Chemical Peel, Derma Roller and Anti-Wrinkle treatment and Fillers, which are all aimed at turning back the ageing clock. 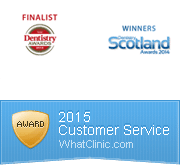 So if you are nervous about visiting the dentist and need a Dundee Dental Practice, why don’t you call Vita Dental Spa and see the difference for yourself.